1. 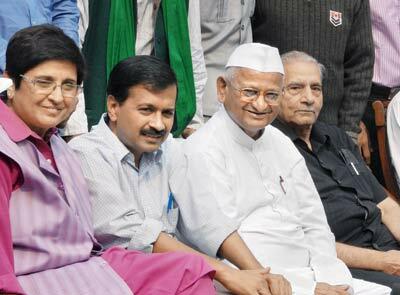 Aam Aadmi Party resolves to legislate the Delhi Jan Lokpal Bill after coming to power. 2. Aam Aadmi Party will legislate the Swaraj Act to devolve power directly to the people. 4. Aam Aadmi Party government will keep its promise of reducing electricity bills by half. 5. AAP will conduct a comprehensive performance audit of discoms by the Comptroller and Auditor General of India. 6. AAP will put Delhi's own power station at the pithead nd comprehensively solve Delhi's electricity problem in long run. 7. AAP reiterates the 2013 Delhi manifesto promise of providing consumers right to choose between electricity providers. 8. AAP will facilitate a phased shift to renewable and alternate sources of energy like Solar Energy. 10. AAP will ensure free lifeline water of up to 20 kiloliters (20,000 liters) to every household per month. 11. AAP will provide universal access to potable water to all its citizens of Delhi at a sustainable and affordable price. 13. Our government will preserve and replenish local and decentralized water resources to augment Delhi's water resources. 14. AAP is committed to clamping down on Delhi’s powerful water mafia working under the patronage of political leaders. 15. Several steps will be taken to revive the Yamuna including sewer treatment and control affluent discharge. 17. AAP will adopt and encourage the use of good practices in waste management techniques from across the world. 18. AAP will build 500 new schools with a special focus on secondary and senior secondary schools. 20. AAP will open 20 new colleges under Delhi administration on the outskirts of the city. 21. We will regulate private school fees by publishing the fee structures and accounts online. 22. AAP will bring in complete transparency in Nursery and KG admissions by using centralized online system . 24. Education and Health will be AAP's top priority. The total budgetary allocation will be increased accordingly. 25. AAP will create 900 new Primary Health Centers (PHCs) and 30,000 more beds in Delhi hospitals. 26. Pharmaceutical drug nd equipment procurement will b centralized to ensure zero corruption with focus on generic drugs. 27. AAP will ensure a 100 percent lighting of streets across the city. 28. AAP will provide effective last mile connectivity in Delhi’s public transit system. 29. AAP plans to install CCTV cameras in DTC buses, bus stands and in crowded places as a deterrent against crime. 30. The AAP government will throw its weight behind rainwater harvesting and strongly push it in a top-down manner. 32. AAP will make provisions for affordable housing for government counsels and lawyers practising in lower courts. 33. AAP will set up Mahila Suraksha Dal or Women’s Security Force made up of a 10,000 strong Home Guard. 34. AAP will work towards its connectivity to police, nearest PCR van, relatives and volunteer community with SOS button. 35. All government services and forms will be made available online and on the phone. 39. AAP will formulate trader-friendly policies nd streamline rules and regulations for setting up and running businesses. 41. Delhi will have the lowest VAT regime in India. We will simplify VAT and other tax structures. 42. AAP will put an end to raid culture and inspector raj. Only under exceptional circumstances will a raid be permitted. 43. AAP will simplify VAT rules, processes and forms. The 30 page long VAT form will be crunched into one page for traders. 44. AAP will promote vocational education and skill development of youth in schools and colleges, to bridge the skill gap. 47. AAP will fill 55,000 vacancies in the Delhi government and autonomous bodies of the Delhi Government. 48. AAP will implement a flexible nd fair labour policy nd will ensure social security for workers in unorganized sector. 49. Delhi Ridge, the lung of the city, will be protected from encroachment and deforestation. 50. AAP will formulate holistic transport policies for all forms of transport including metro, buses, auto rickshaws etc. 51. AAP will expand bus services in Delhi on a massive scale, adding at least 5,000 new buses to the city fleet in 5 yrs. 52. AAP will formulate clear policy and standards fr ownership nd operation of e-rickshaws, keeping safety aspects in mind. 53. AAP will collaborate with the Indian Railways to extend and develop the Ring Rail service in Delhi. 54. AAP will facilitate bank loans for purchase of autos. Trainings will be conducted for auto drivers to improve conduct. 56. Within one year of government formation unauthorized colonies will be regularized nd residents will b given ownership. 57. Over 200 acres of land is currently lying vacant with Delhi Urban Shelter Improvement Board will be used for housing. 58. In situ development of slums will be done. Ppl will be provided plots or flats in the same location as existing slums. 59. The government will initiate a universal and non-contributory old age pension system immediately. 60. Measures will be taken to prevent hoarding, profiteering, black market operations, hoarding and speculative trading! 61. AAP will prevent drug trafficking by means of tight monitoring and ensuring strict punishment for the guilty. 62. AAP will help children with disability get admission into schools and colleges and help in empowering the disabled. 63. AAP will notify the SIT that we had ordered in January 2014 to re-investigate the 1984 anti-Sikh killings. 64. AAP will stand by the nation’s ex-servicemen in their fight for “One Rank, One Pension”. 65. Upholding the spirit of Swaraj, Mohalla Sabhas will set up peace committees to ensure harmony in their neighborhoods. 66. AAP will end contractualisation in “safai karamchari” posts and will regularize existing employees. 67. AAP will take steps to end the discrimination against and harassment of denotified and nomadic communities in Delhi. 69. Research in Sanskrit, Urdu and Punjabi shall be encouraged in various Delhi state universities. 70. A public library or community-reading space will be created in every constituency of Delhi.